The colliery was known as the Flour Mill, presumably because the way to it from the village of Bream passed the Oakwood water mill. There is no evidence of a flour mill ever being directly on the site of the colliery, and no known association with flour or milling. However the colliery was at one time the largest employer in Bream, and most families originating from the village have one or more relative or ancestor who worked there. The building was in a near ruinous state, with trees growing out of the walls and much of the floor missing. Bob (Rob) Haddock of Lydney and John Harris of Alvington worked tirelessly and bravely for over two years to make it fit for its new use, rebuilding the tops of the walls and replacing the cast iron gutters and downspouts, re-rendering the inside walls, cleaning and treating the magnificent pitch pine roof boarding, and repointing the external stonework. Ken Habgood and Vic Clemm, two Swindon-trained coachbuilders, built a splendid pair of wooden doors 17’ high, using the floor as a bench, which were installed in a new doorway made from an enlarged window opening by Hodson & Co of Coleford. Sixteen years after the construction of the Oakwood tramway by David Mushet, in August 1843 William Jones applied to the Crown for permission to mine at the site now occupied by the Flour Mill, but soon sold his interest to George Skipp, who opened a wood distillery or chemical works, thought to have made “pyroligneous acid”, lead acetate, wood-tar and wood-pitch. This was sold in 1854 to Isaiah Trotter of Coleford, a well known Forest businessman, who ran the business at least until 1887. After several more owners it eventually closed in 1900. Meanwhile Ralph and Arthur Price leased two acres nearby from the Crown for 31 years at a rent of £5 p.a. and began to sink a shaft in 1866, which was presumably completed by 1870, if not before, as they then applied for a connection to the Oakwood tramway, which ran past the site. The Flour Mill Colliery Company Ltd was formed in December 1873, but was in liquidation by January 1875, probably due to water problems, although ‘good coal’ was sold in 1874 at the colliery for 17s (85p) per ton. 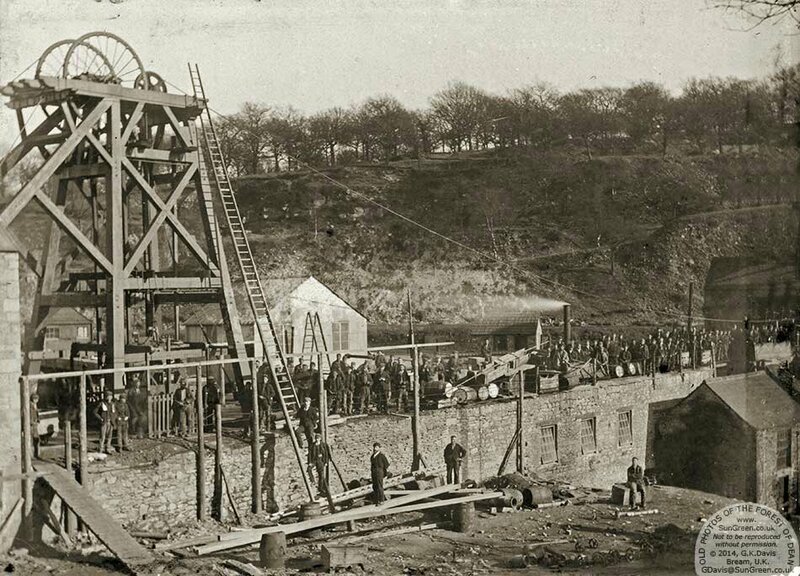 Evidently mining was carried on, because by November 1886 the colliery was owned by William Camm and Richard Watkins, who owned the nearby Princess Royal (also known as Park Gutter) colliery, which also had water problems. In 1892 a rope-hauled tramway was built to take Flour Mill coal for cleaning and sorting by new screens at Princess Royal, necessitating the construction of a broad bridge or ‘tunnel’ over the Oakwood Tramway. Another shaft, 140 yards deep and 14’ in diameter, was sunk in 1904, but proved to be very wet. The new shaft necessitated another cut and cover bridge/tunnel to be built over the Oakwood tramway, to the north of the first tunnel, to enable trams of coal to be pulled to Princess Royal. Flour Mill colliery was taken over by the Princess Royal Colliery Company in 1906. As a result of the water flowing into the mine, massive pumping was required, and in 1908 construction of a new building at the Flour Mill commenced, 100’ long, 40’ wide and 25’ high to the eaves. This housed two sets of Bellis & Morcom triple-expansion “high speed electrical engines”, one reportedly of 750kw running at 250 rpm and one of 350kw running at 333 rpm, powered by four Lancashire boilers in another building adjoining, now gone. It is probable that the building was doubled in length during construction, as some window details differ in the second four bays from the first four. Completed in 1909, this is the building that now houses the locomotive repair operations of The Flour Mill Ltd. The building has bolted iron roof trusses with diagonal bracing. The use of electrical power at this date was still something of a novelty. Trafalgar Colliery, also in the Forest of Dean, was the first colliery in the world to use electrical power underground for motive power, in 1882, while the City of Gloucester only received its first general supply, on a very limited scale in 1900. The two collieries, Flour Mill and Princess Royal, were connected underground in 1916 to improve ventilation and safety, and to permit larger-scale production. However the stables for the pit ponies remained at the Flour Mill – the cages were so small that the ponies had to sit on their haunches going down or up the shaft! The Flour Mill colliery had a long and interesting life: there was a strike in 1909, when the pit ponies were sold, and then the bitter national strike of 1912. Several men were killed in the pit, one during the sinking of the first shaft. The main shaft was used as an emergency second way out, but after the war the pit was connected to the National Grid and the power station no longer needed. The whole area around the Colliery holds a wealth of interesting material. North of the colliery buildings, the colliery spoil heap is relatively small. It sits alongside the old tramroad route (SMR 15249), with some fine stonework in the form of sidings and 2 tunnels in basically sound condition. This tramroad continues north running alongside a stream which then forms a pond. This area is a Gloucestershire Wildlife Trust botanical site. The tramroad doubles as a path and continues north. The mine shaft has been capped, while a depression near the buildings suggests a second filled shaft. A rope-worked tramway was laid in 1891 from Flourmill Colliery to Princess Royal Colliery (Park Gutter) (SMR 5844), enabling coal to be brought to the new screens there and link with the Severn and Wye Railway. 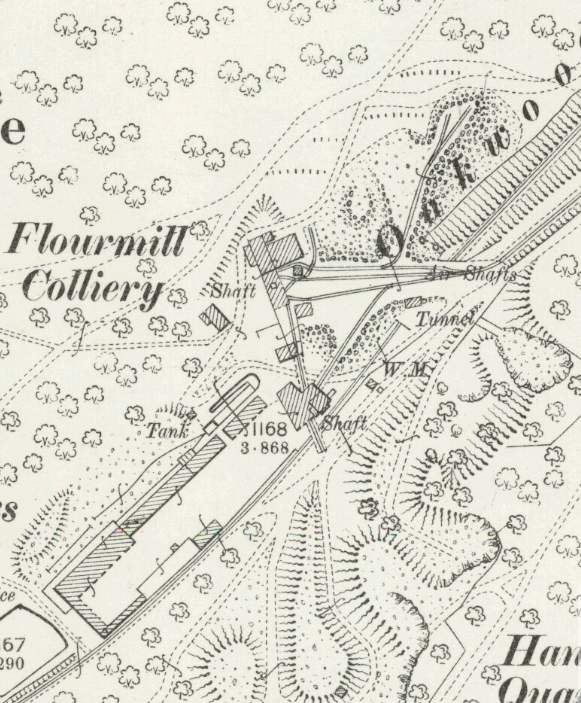 The colliery was connected underground to the Princess Royal Colliery (aka Park Gutter)and also through that colliery to Norchard Colliery nr Lydney and New Norchard Colliery at Pillowell.Flour Mill had 3 shafts and in later years was only used for ventilation and maintenance of Princess Royal Colliery. Most of this whole complex of collieries was closed in 1961/62 although some coal from the New Norchard Colliery was still processed at the Princess Royal site up until 1965. The 2 ‘small’ shafts at Flour Mill were filled around that time (1965/66) but the impressive main shaft was capped and left forgotten until 2007. It was finally filled and recapped by the close of 2008. 2. Gloucester County Council Historic Environment Report Monument No. 5826. This entry was posted in Forest of Dean, Railways Blog on September 30, 2017 by rogerfarnworth.